Erected 1906 by Dial Rock Chapter, Daughers of the American Revolution. Location. 41° 19.768′ N, 75° 47.253′ W. Marker is in Pittston, Pennsylvania, in Luzerne County. 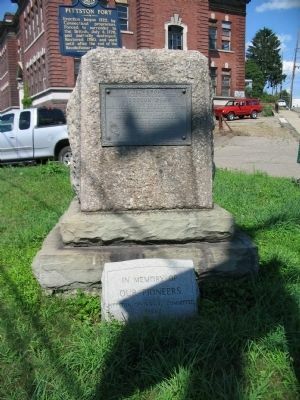 Marker is at the intersection of North Main Street and Parsonage Street, on the right when traveling north on North Main Street. Touch for map. 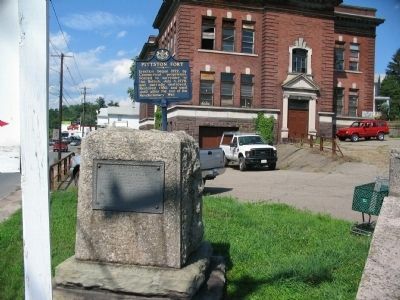 Marker is in this post office area: Pittston PA 18640, United States of America. Touch for directions. 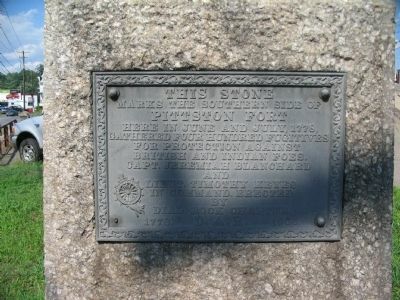 At the foot of the stone is a memorial stone, In memory of our pioneers, Pittston Centennial Committee, 1954. (approx. 0.3 miles away); Erie Railroad Co. v. Tompkins (approx. half a mile away); World War Memorial (approx. 0.6 miles away); Workers in Greater Pittston's Garment Industry (approx. 0.6 miles away); Veterans Memorial (approx. 0.7 miles away); Twin Shaft Disaster (approx. 0.8 miles away). Touch for a list and map of all markers in Pittston. More. Search the internet for Pittston Fort. Credits. This page was last revised on June 16, 2016. This page originally submitted on August 20, 2008, by Craig Swain of Leesburg, Virginia. This page has been viewed 1,350 times since then and 10 times this year. Last updated on June 14, 2012, by Sharleen Palaima of Pittston, Pennsylvania. Photos: 1, 2, 3. submitted on August 20, 2008, by Craig Swain of Leesburg, Virginia.